Summertime brings really hot weather, but there's still things to do for fun in the sun and shade. Soon the weather brings a storm which cools the temperatures and brings with it a different fun. 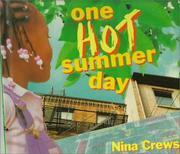 Crews, Nina, “One hot summer day,” Children's Picture Book Database at Miami University, accessed April 21, 2019, https://dlp.lib.miamioh.edu/picturebook/items/show/7099.